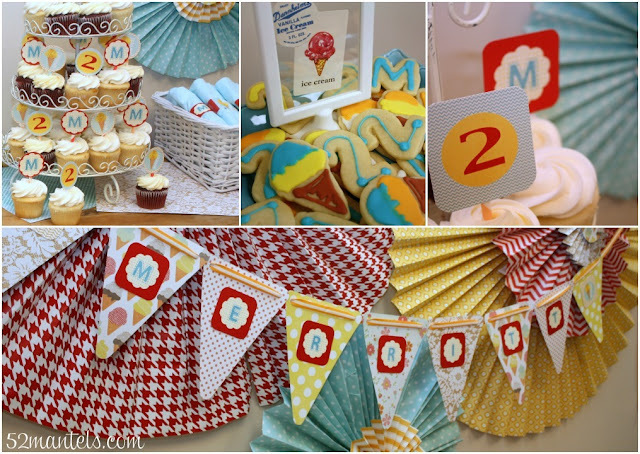 Last week I showed you the details from my daughter's ice cream themed, 2nd birthday party. And, today I'm sharing a fun freebie with you...free ice cream party printables! Of course, my "2" and "M" toppers wouldn't be very helpful to most of you, so I've changed the design to be more generic. I think the new design is super cute! 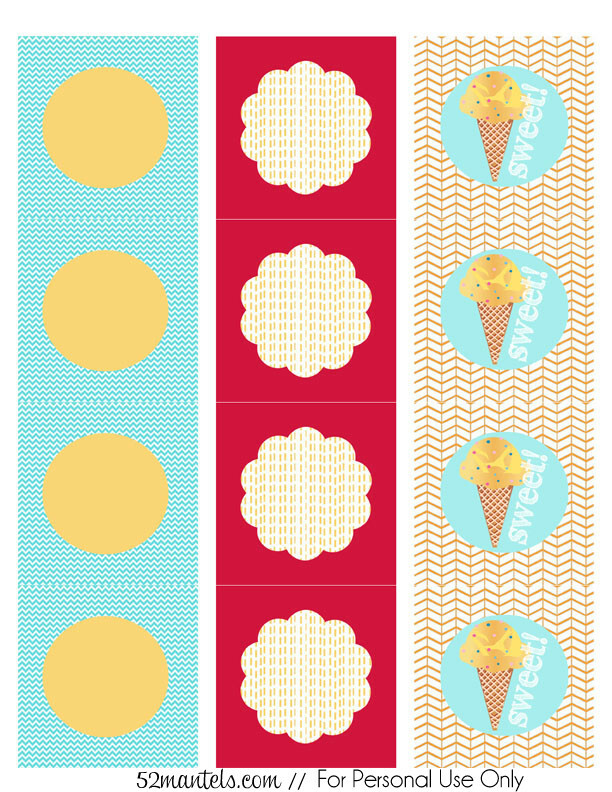 This printable set can be used for cupcake toppers or as favor-tags. For favors, I cut the design out as squares and used my corner-rounder to round the edges. Then I attached them to my colorful bubbles with a length of twine. For our party, I made a few cupcake toppers as rounded squares and then the rest as 2" circles. 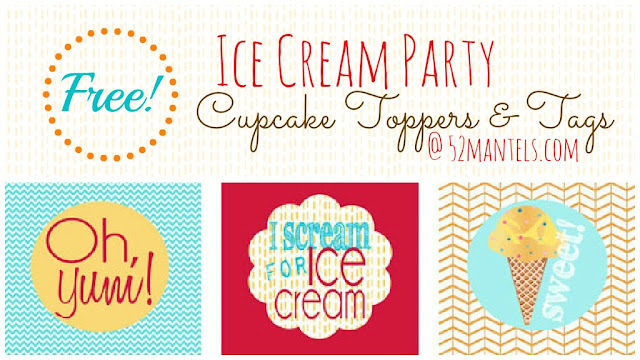 To assemble the cupcake toppers, print the image on 8.5x11" white card stock. Use a 2" circle punch for circle toppers or cut them out as squares (rounded edges optional with a corner rounder!). Simply attach the design to a cake-pop stick (or a fun, paper straw, like I did!) with a piece of tape. Easy and cute! To use this freebie, right-click and save the image to your computer. Then, print it on 8.5x11" card stock. 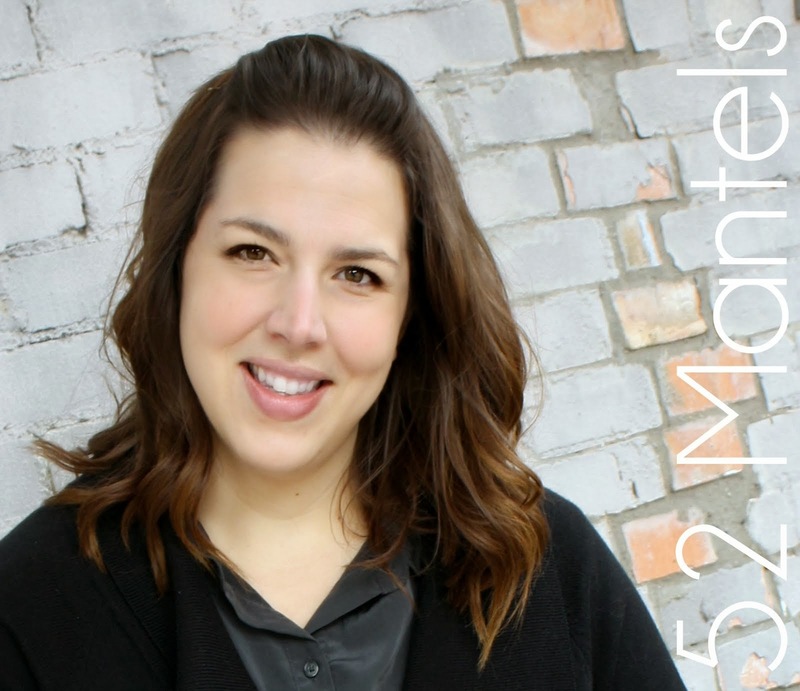 When setting up the image, remove the margins from your page in the page set-up. The image has a one-inch white margin and should cover the entire paper when printing. 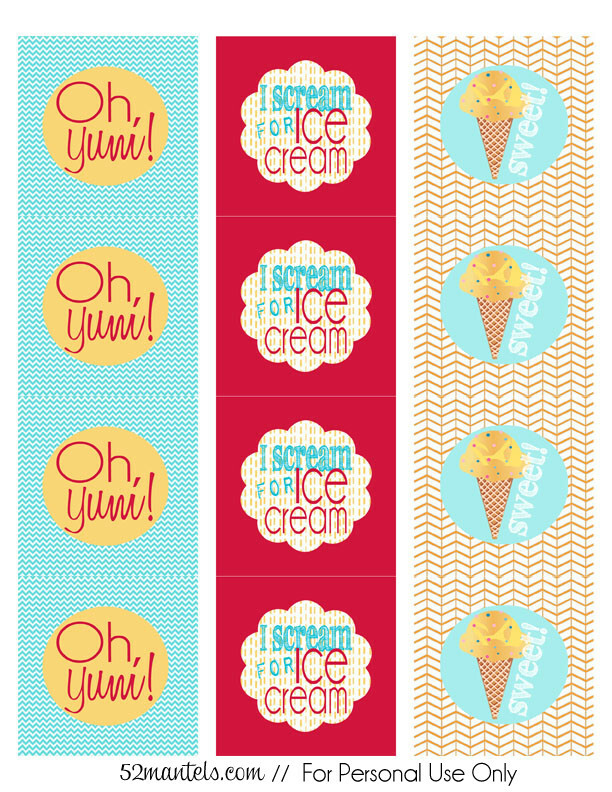 In case you'd like to personalize your tags, I've included a freebie with some blank designs. 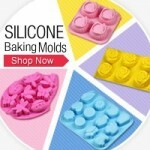 Upload the image into picmonkey or use an editing program to add personalized text to the centers! Very cute! Thank you for sharing! Pinned them too. So cute!!! Love all your printables!!! Thanks so much! These are so adorable! Love these printables! 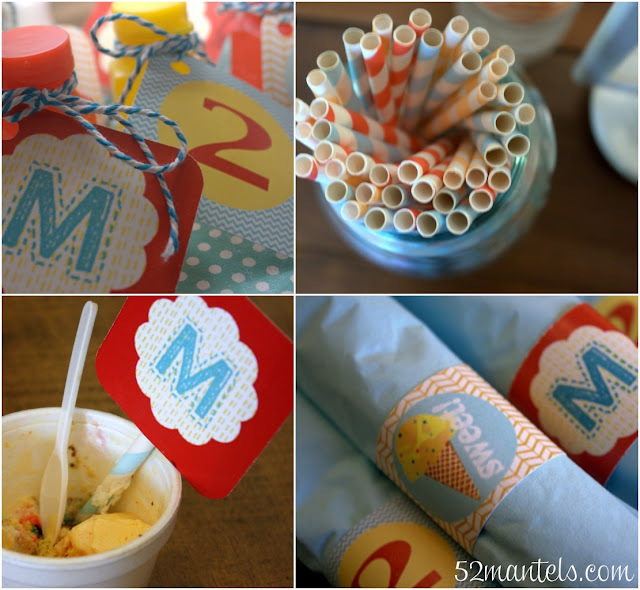 I love this, and it will be perfect for my son's end of school ice cream party! Can I ask where you got an invitation that is similar, i am having a really hard time. Thanks. Adorable! These will be perfect for my daughter's 4th birthday party this weekend. Thank you!! Salam Sejahtera Untuk Semua??? Kita Di Sini Mau Berbagi Sedikit Tentang Cara Menggugurkan Kandungan Atau Obat Aborsi Asli Ampuh Mungkin Di Telinga kita Tidak Asing Lagi. Tentang Kata “ABORSI“. Apa Itu Aborsi??? Bagaimana Cara Aborsi??? Dan Obat Aborsi Terpercaya Apa Yang Di Pakai Untuk Aborsi?? Please Visit and review this website Konveksi Tas Seminar , Jual Tas Seminar .